“I believe that the truth deserves a screening.” As the tagline of The HeArt Project, and firm belief of its Founder, Arthur Keng – the aim is to triumph the flood of negative mass media on bad news and decadent gossip, through hope, inspiration and the empowerment of people from all walks of life. Arthur Keng, Founder of The HeArt Project and Art Space. Also pronounced as “the hard project” – the hard truths of life take centre stage in tasteful documentary perspectives, letting viewers take in the stories of each feature and leave with valuable life lessons. You may be wondering about the capitalised ‘A’ in “HeArt” – which we’re told is to highlight their strong belief in Art and its form to impact the hearts of its audience. Gabriel Yip, alongside Chu Yin – who would be featured in The HeArt Project’s upcoming webisodes. Realising one day that Gabriel didn’t attend his regular club activities session, Arthur dug deeper only to find out he was hospitalised due to leukaemia. Reconnecting with Gabriel after he was discharged and after he started getting back to school life – the success of his recovery was a story Arthur challenged himself to tell, for Gabriel and the others who were facing similar struggles. Along the way on making Gabriel’s story – one of many for The HeArt Project – Arthur met many others who believed in the cause and chipped in to lend a hand. Starting with Audrey Chin who helped with interviewing Gabriel in National University Hospital (NUH), by mending the second camera despite having no prior experience with it. Partnering with NUH on this project wasn’t initially part of the plan, but by wanting to go all out to bring forth the genuity of the project, Arthur reached out and asked if they could replicate a shoot at a cancer ward. Within a month, official approval was granted by NCIS to shoot at the actual Chemotherapy Ward in NUH, and even had Gabriel’s doctor, Dr. Joanne Lee become part of the interview session. This all in the hopes that Gabriel’s recovery story can inspire many other patients too! Presenting Daniel Yoong, who did the track composition for the first The HeArt Project webisode. Next, Boston-based Daniel Yoong came onboard when he heard about the project during their usual Skype catch-up calls. Jumping onboard instantly and starting their first collaboration together, Daniel gave it his all by composing the 67 tracks that accompany Gabriel’s story – despite the talented musician’s busy schedule in the States. This was further enhanced with the audio mixing by Producer, Dru Chen, when they connected with Arthur wanting to learn more about audio engineering, before forming a valuable friendship in the end. Given dibs to see the first cut of the project, Dru dived in as he loved the meaning behind the project. A shot of Dru Chen, the brains behind the audio mixing for the video starting Gabriel. Last but not least, the designs for The HeArt Project (and its host, Art Space) were done by Paolo Tugano – a Phillipines-based hand letterer and designer. Searching Instagram for letterers and after shortlisting a few candidates, Arthur bounced off the works through his network and Paolo naturally had the best fit – with the rest, history. While it took a year to start, Arthur’s passion project is going strong! 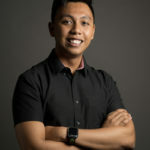 Being a young Malaysian filmmaker himself – with the credentials of being a Film Sound & Video graduate from Ngee Ann Polytechnic, and is currently working in Singapore as an Editor for the Channel 5 TV Show, Tanglin – he has basically been the one-man-show of the operation! Paolo Tugano, the brains behind the beautiful lettering of The HeArt Project and Art Space. It’s been amazing, and we’re pretty astounded by the journey The HeArt Project has embarked on thus far! “Looking at all of these, I am speechless to know that I have professionals partnering with me to make this vision come true! Even if one person receives a breakthrough after watching any of the episodes, it is worth all the work,” Arthur notes. Looking ahead, there are plans to release two more episodes in May and June 2018, with a total of 10 episodes in mind. I don’t know about you, but that means there’s a lot more to look forward to! If people can wait for a Game Of Thrones or Sherlock Holmes episode fortnight after fortnight, we’re pretty sure this isn’t going be a problem! Check out the premiere webisode of The HeArt Project below!